Several studies highlight a key involvement of endocannabinoid (EC) system in autism pathophysiology. The EC system is a complex network of lipid signaling pathways comprised of arachidonic acid-derived compounds (anandamide, AEA) and 2-arachidonoyl glycerol (2-AG), their G-protein-coupled receptors (cannabinoid receptors CB1 and CB2) and the associated enzymes. In addition to autism, the EC system is also involved in several other psychiatric disorders (i.e., anxiety, major depression, bipolar disorder and schizophrenia). This system is a key regulator of metabolic and cellular pathways involved in autism, such as food intake, energy metabolism and immune system control. Early studies in autism animal models have demonstrated alterations in the brain’s EC system. Autism is also characterized by immune system dysregulation. This alteration includes differential monocyte and macrophage responses, and abnormal cytokine and T cell levels. EC system dysfunction in a monocyte and macrophagic cellular model of autism has been demonstrated by showing that the mRNA and protein for CB2 receptor and EC enzymes were significantly dysregulated, further indicating the involvement of the EC system in autism-associated immunological disruptions. Taken together, these new findings offer a novel perspective in autism research and indicate that the EC system could represent a novel target option for autism pharmacotherapy. According to US National Institute of Mental Health, autism spectrum disorder (ASD) is the name for a group of developmental disorders  and is characterized by the diagnostic and treatment manual for mental disorders, fifth edition (DSM-5), as possessing persistent deficits in social communication and interaction, restricted, repetitive patterns of behavior, interests, or activities [2,3]. ASD includes a wide range (the so called spectrum) of symptoms, skills, and levels of disability. However, DSM-5 does not include subcategories of a larger disorder, but the range of characteristics and severity within one category are described . Symptoms of ASD begin in early childhood, and produce clinically significant developmental impairment . Some cases of ASD children display genetic or chromosomal abnormalities as seen in Fragile X syndrome or Down syndrome; however, most cases of ASD have an unknown etiology . Based on most recent prevalence data, worldwide population prevalence is about 1% . Intellectual disability is present in about 45% of individuals with autism and 32% have regression . The inflammatory state has been shown to be associated with ASD in many studies which show abnormalities in immune system components . A recent study showed that interleukin 8 was significantly increased in blood of children with ASD . Further, immune system disruption [7,8] and immune system dysfunction have been implicated in ASD [9,10,11,12,13,14]. These abnormalities include differential monocyte responses, abnormal T helper cytokine levels, decreased T cell mitogen response, decreased numbers of lymphocytes, and abnormal serum immunoglobulin levels. Arima et al. have shown that regional neuronal activation provides a mechanism by which autoreactive T cells may cross the blood brain barrier . Neutrophils have been shown to mediate disruption of the blood-spinal cord barrier in some neuroinflammatory diseases , which may have implications for autism. ASD children display differential monocyte responses to toll-like receptor ligands . Other studies have shown that children with autism exhibit immune system abnormalities, in particular for antibodies against brain and central nervous system proteins, as well as against maternal proteins [18,19,20,21,22,23,24,25], and increased plasma pro-inflammatory cytokine levels [26,27]. The relationship of serum anti-neuronal antibodies and increased autism severity has been demonstrated . Aktas et al. have demonstrated neuronal damage in autoimmune neural inflammation which is mediated by the death ligand TRAIL . Garay et al. have proposed novel roles for immune system molecules in neural development that may have implications for autism . They proposed that major histocompatibility complex I (MHCI) and its receptors, complement, and cytokines influence the function and development of brain synapses and influence the development of ASD. Over-expression and activation of several caspases was found in autistic peripheral blood mononuclear cells . Among them, the mRNA levels of pro-inflammatory caspase-1, -4 and -5 and protein levels of caspase-7 and -12 were significantly increased, along with over-activation of caspase-3. The endocannabinoid system (EC) is comprised of arachidonic acid derived compounds, their receptors and the associated enzymes (Figure 1) . The EC system represents an intricate network of lipid signaling pathways. The naturally occurring EC “building blocks” are N-arachidonoylethanolamine (anandamide, AEA) and 2-arachidonoyl glycerol (2-AG), that exert their effects through the G-protein-coupled cannabinoid receptor (GPCR) type 1 (CB1) and type 2 (CB2), which, in turn, are negatively coupled to the adenylate cyclase enzyme . AEA (whose name derives from “ananda” that in Sanskrit means “joy” ) and 2-AG are part of the molecular group of N-acylethanolamines (NAEs) and monoacylglycerol (MAG) glycerophospholipids classes , and were the first described endogenous ligands of CB receptors [36,37]. The two CB1 and CB2 belong to the class-A GPCR subfamily receptors . They are heptahelical transmembrane receptors in that the N-terminal domain is localized outside the membrane and contains the ligand bound site, whereas the C-terminal domain is localized in the cytosol and interacts with a Gi protein. Classically, CB1 is mainly located in central and peripheral nervous system and CB2 in immune cells, even though some neurons are able to express CB2 receptors . Figure 1. (Adapted from , with permission of Springer.) Endocannabinoids, such as N-arachidonoylethanolamine (anandamide, AEA) and 2-arachidonoyl glycerol (2-AG), are synthesized and released upon demand in a receptor-dependent way, through the AEA biosynthetic enzyme N-acylphosphatidylethanolamine-hydrolyzing phospholipase D (NAPE-PLD) and the diacylglycerol (DAG) lipase enzyme, respectively. They exert their effects through the G-protein-coupled cannabinoid receptors CB1 and CB2, which, in turn, are negatively coupled to adenylyl cyclase enzyme. 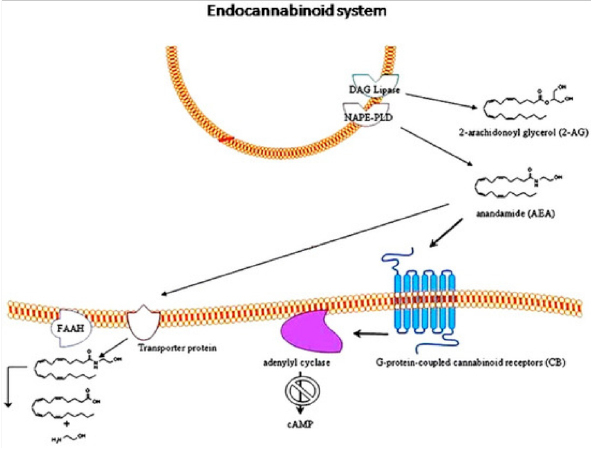 After the specific binding with their receptors, endocannabinoids are transported into cells by a specific uptake system and degraded by the enzymes fatty acid amide hydrolase (FAAH). AEA and 2-AG are synthesized “on demand” from lipophilic precursors and immediately released without being stored in vesicles . Once bound to CB receptors, AEA activates a signal transduction pathway, resulting in blocking the production of the intracellular second messenger, cyclic adenosine 3′,5′-monophosphate (cAMP) [40,41]. Indeed, CB1 and CB2 receptors are Gi protein-coupled receptors that, once activated, are able to block most isoforms of the adenylate cyclase enzyme . However, co-expression of CB1 or CB2 with adenylate cyclase isoforms 2, 4, or 7 resulted in stimulation of cyclic AMP accumulation , and may indicate a second method for cannabinoid activation to influence cellular processes. Blocking of the adenylate cyclase enzyme inhibits the synthesis of cAMP; as result, the cellular activity is highly modulated. The main enzyme affected by lower levels of cAMP is the protein kinase A (PKA), a key cAMP-dependent enzyme involved in phosphorylation-mediated activation of several biochemical events inside the cell, including regulation of gene expression [44,45]. cAMP-dependent PKA is a heterotetramer composed of two regulatory (R) and two catalytic (C) subunits. The specificity and the versatility of the cAMP-PKA is due to the regulatory and the catalytic subunits that possess distinct physical/biological propertiesand are able to form different isoforms of PKA holoenzymes . PKA is able to regulate several genes through a wide range of different transcription factors. Increased levels of cellular cAMP trigger the dissociation of the PKA heterotetramer, the C subunits migrate into the nucleus by passive diffusion and catalyze the phosphorylation of the cyclic AMP response element (CRE)-binding protein (CREB), allowing the transcription of genes controlling cellular metabolism (i.e., gluconeogenesis) and respiration . cAMP-PKA enzyme is a key regulator of physiological processes such as activation of ion channels in the nervous system, regulation of the cell cycle (microtubule dynamics, chromatin condensation and decondensation, nuclear envelope dissambly and reassembly), and intracellular transport mechanisms . Among the biological processes, cAMP-PKA signaling pathway is involved in diabetes insipidus and mellitus, hypertension, gastric ulcers, thyroid disease, asthma, in the control of metabolism in adipose tissue and in the regulation of steroidogenesis, reproductive function, and immune responses . However, other enzymes regulated by CB1 activation include focal adhesion kinase, mitogen-activated protein kinase, phosphatidylinositol 3-kinase, and several enzymes involved in energy metabolism . The enzyme N-acylphosphatidylethanolamine-hydrolyzing phospholipase D (NAPE-PLD) is a metallo-β-lactamase able to catalyze the hydrolysis of NAPEs, in this way forming AEA . X-ray fluorescence analysis has revealed that the metal center of NAPE-PLD enzyme contains two zinc atoms. This binuclear metal center is responsible for binding and orienting the substrate for catalysis . Once unbounded after being bind to the receptor, AEA is physiologically inactivated by uptake into the cells, followed by catalytic hydrolysis via fatty acid amide hydrolase (FAAH) . NAPE-PLD and FAAH enzymes are the other components of the EC system. The EC system plays a key role in several psychiatric disorders (i.e., anxiety, major depression, bipolar disorder and schizophrenia) . 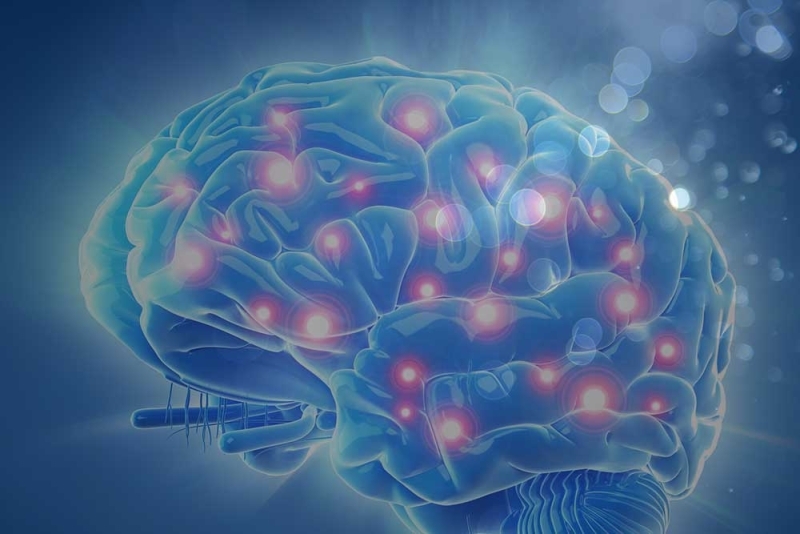 Endocannabinoids, by modulating synaptic neurotransmission, are involved in the development of the central nervous system . Indeed, 2-AG, through CB1 receptor activation and consequent ERK1/2 phosphorilation, is able to modulate synaptogenesis, axonal outgrowth, neuronal cell fate, migration and proliferation [53,54]. 2-AG shows a key role in post-traumatic stress disorder and memory . It has been demonstrated that stimulating hippocampal CB1 receptors, directly through the synthetic cannabinoid receptor agonist WIN55212-2 or indirectly with a 2-AG hydrolysis inhibitor, is able to increase the spatial memory performance of rats trained under a higher stressful condition . Interestingly, it has been proposed that the placenta, fetal adipose tissue and nervous tissues could interact via EC signals and that maternal nutrition during pregnancy could affect the formation and function of the hippocampus and hypothalamus by altering EC signaling . It is likely that at the basis of this involvement in brain disorders there is the link between the EC system and neurotrophin signaling. Brain-derived neurotrophic factor (BDNF) and CB1 receptors cooperate to protect against excitotoxicity . Genetic or pharmacological blockade of CB1 receptor increased neuron scusceptibility to kainic acid-excitotoxicity; interestingly, exogenous BDNF counteracted the damages of CB1 receptor inactivation, also preventing neuronal death . Furthermore, CB1 receptor activation is able to induce the expression of immediate early genes, including BDNF mRNA . A cooperation between CB1 and fibroblast growth factor (FGF) drives axonal growth . CB1 receptor also shows neuroprotective capacities by decreasing tumor necrosis factor (TNF)-α levels in neurodegenerative conditions . ECs are also linked to neurotransmitters, in that dopamine transmission and the EC system exhibit feedback controls on each other. Indeed, cannabinergic signaling is able to release dopamine, whilst dopaminergic signaling, via dopamine D2-like receptors, lead to up-regulation of EC signaling . EC signaling also functions as a retrograde signaling system in GABAergic and glutamatergic synapses (inhibitory effect on glutamate) [62,63]. The fact that the EC system represents the link between immune and central nervous systems is also worth noting . CB2 receptors are primarily located on immune system cells and serve as immune system modulators , while CB1 receptors are located in the central nervous system (particularly in cerebral cortex, hippocampus, basal ganglia, and cerebellum, lower levels are detectable in hypothalamus and spinal cord), peripheral nervous system, and peripheral organs . ECs influence neuroimmune function and neuroinflammation and are also a key regulator of other metabolic and cellular pathways involved in autism, such as food intake, energy metabolism and control of the immune system. In the CNS, CB1 receptors are expressed in the cerebellum, hippocampus, and the basal ganglia , which are areas in the brain implicated as dysfunctional in autism [67,68]. It has been demonstrated that during development, CB1 receptors drive axon guidance and are responsible for synaptogenesis [56,69,70]. Autistic children have been shown to have abnormal brain connectivity, which could be due to lack of CB1 axon guidance . In the immune system, CB2 receptors act as modulators . They are responsible for control of the movement of inflammatory cells to the site of injury . CB2 receptor agonists are able to decrease TNF-α-induced human endothelial cell activation and transendothelial migration of monocytes by interfering with endothelial adhesion . In the valproic acid (VPA) rat model of autism, CB1 receptors displayed altered phosphorylation in different brain areas associated with changes in AEA metabolism . Interestingly, in VPA-exposed rats the expression of NAPE-PLD was reduced, whereas the expression of FAAH was increased, indicating a reduced AEA-mediated signaling that could be responsible for the deficits in the communicative and social domain. Furthermore, the administration of the AEA hydrolysis inhibitor URB597 ameliorated the social and behavioral deficits . FAAH inhibition as strategy to increase social behaviors was further confirmed both in the VPA model and in an inflammatory rat model [75,76].VPA-exposed rats showed reduced peroxisome proliferator-activated receptor (PPAR)α/γ and orphan G protein-coupled receptor 55 (GPR55) expression in the frontal cortex and hippocampus . These biomolecules are additional alternative receptor targets of the ECs involved in behavioral changes. It is to be considered that, like all animal models, VPA-exposed rodents do not fully replicate the human disease; however, this model provides a valuable tool to investigate the neurobiology underlying autistic behavior and to identify for novel therapeutic targets . Several evidences demonstrate a key role for the EC system in ASD (Table 1). It was confirmed by Foldy and colleagues that found that neuroligin-3 mutations associated with autism commonly disrupt tonic EC signaling , as well as by in vitro data demonstrating that CB2 receptors are up-regulated (both mRNA and protein levels) in autistic-derived peripheral blood mononuclear cells . Interestingly, the mRNA for the AEA-synthesizing enzyme NAPE-PLD was significantly decreased . The simultaneous up-regulation of CB2 receptors and down-regulation of NAPE-PLD in these type of immune cells indicates that EC system drives immune-mediated changes in autism. More interesting, in vitro monocyte-derived macrophagic cells from individuals with ASD further display EC system dysregulation . This indicates the involvement of the EC system in autism associated immunological disruptions, as macrophages are specialized cells strongly involved in inflammation responses . Further, autistic in vitro monocyte-derived macrophages showed an increase in AEA-biosynthetic enzyme NAPE-PLD, together with a decrease in the AEA catabolic enzyme FAAH, indicating an overall increase in the EC AEA levels . As natural agonist of CB2 receptors, AEA down-regulates cAMP production. Agonist-induced inhibition of adenylyl cyclase enzyme in cells expressing human CB2 receptors has been demonstrated . Autism Spectrum Disorder. Available online: https://www.nimh.nih.gov/health/topics/autism-spectrum-disorders-asd/index.shtml(accessed on 23 June 2017).